Want to see films in English at the Cinema? There are plenty of cinemas in Zurich showing films in English. Take a look here to get some ideas on where to go. Just to let you know that often (in fact usually) there is an intermission during the film when you have a 10 minute break to get refreshments. Please note that they can also be quite strict about proof of age (and adhering to film age limits) when taking children to the cinema. The Cineman website shows you what’s on at the cinema here. If you’re looking for films in English language (rather than dubbed for example) then you need to check that it states EN after the film. Kinoculture also tells you which films are currently running in Zurich. See here. 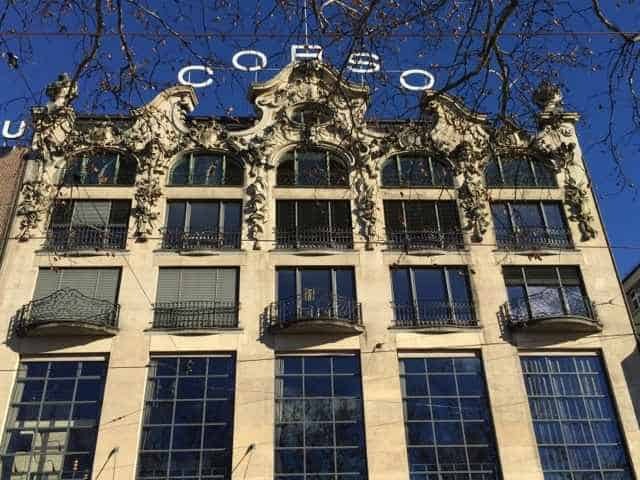 Visit the Corso website here. See the Corso on Google Maps here. You can get there by train to Stadelhofen railway station or with trams number 11 and 15. Visit the Arthouse Le Paris website here. See the Arthouse Le Paris on Google Maps here. The Arthouse Piccadilly is also located about 2mins walk from Stadelhofen station at Mühlebachstrasse 2, 8008 Zürich. You can reach it with the train to Stadelhofen or tram numbers 11 or 15. Visit the Arthouse Piccadilly website here. See the Arthouse Piccadilly on Google Maps here. The Arena cinema is located at Kalanderplatz 8 at Sihlcity, 8045 Zurich. You can read it by trams 5, 13 or 17 to Sihlcity Nord. Visit the Arena Sihlcity website here. See the Arena Sihlcity on Google Maps here. You can reach it either by taking tram 2, 6, 7, 8, 9, 11 or 13 to Paradeplatz and a short walk or tram 2 or 9 to Sihlstrasse and a short walk. Visit the Filmpodium website here. See the Filmpodium cinema on Google Maps here. You can reach it by taking bus 32 to Röntgenstrasse or tram 4, 13 or 17 to Limmatplatz. Visit the Riffraff cinema website here. See the Riffraff cinema on Google Maps here. The Houdini Cinema is based at Badenerstrasse 173, 8004 Zurich. Visit the Houdini Website here. See the Houdini Cinema on Google Maps here. The Metropol is located at Badenerstrasse 16, 8004 Zurich. See the Metropol Cinema on Google Maps here. Visit the Metropol Cinema website here. Xenix is more of a FilmClub showing a variety of types of film and there are many classic and English language films running here. Xenix is located just of Helvetziaplatz at Kanzleistrasse 52, 8004 Zurich. Visit the Xenix cinema website here. See Xenix on Google Maps here. KOSMOS is a multifunctional culture and event forum with six movie theaters, a book store, with a café, bar and restaurant attached. Please check the language of the film you want to see before booking as many (but not all) of the films are in German language only. KOSMOS is located at Lagerstrasse 104, 8004 Zürich. Visit the KOSMOS website here. See KOSMOS on Google Maps here. You might also be interested to know that Netflix is now available in Switzerland too. Please also check our Films section for films we have seen in Zurich, often with a Swiss connection. The dates for the Allianz Openair 2018 at Zurichhorn were 19th July – 19th August. For more information please visit the webpage here. Allianz Openair Zurich 2017 – see our article about here. Allianz Openair Zurich 2016 – See our article all about it here. 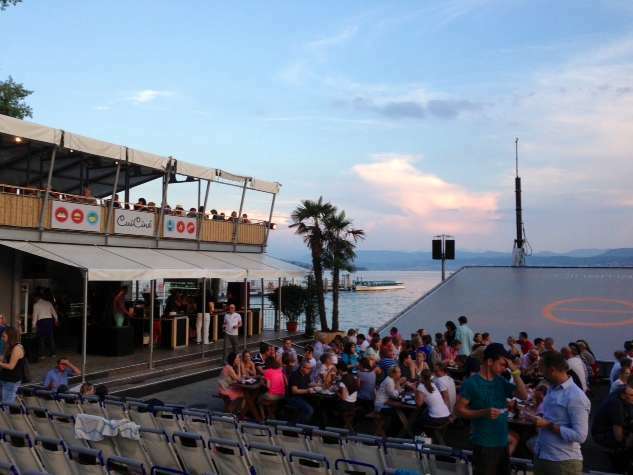 Take a look at the other smaller Openair cinemas in and around Zurich: Please take a look here or see below. The 14th edition of ZFF will take place in Zurich from 27th September to 7th October 7 2018. Find out all about it by clicking here. 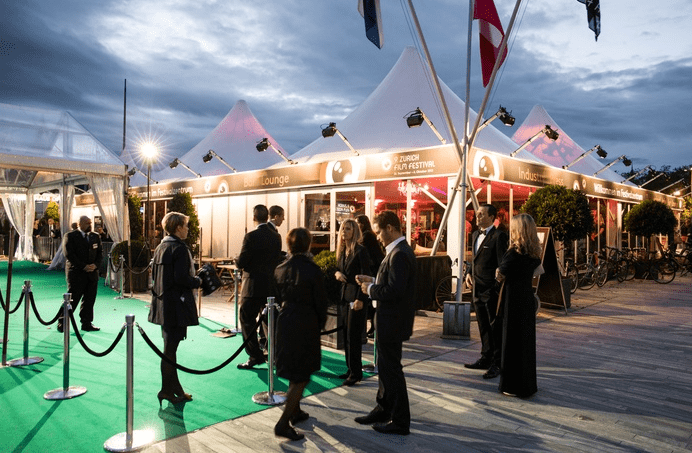 The Zurich Film Festival 2017 took place from 28th September to 8th October and was a great success. Read more about the highlights here. The 12th edition of the ZFF took place in 2016 from 22nd September – 2nd October.There were 161 films shown from 27 countries as well as film master classes and gala premieres. Read our interview with Mike Leigh from the Zurich Film Festival 2015 here. As Zurich is a small city you often get the chance to see the stars at close quarters as they walk along the green carpet or even sometimes just sightseeing in town. The ZFF also run a 72 second film-maker contest, a kids films section at the festival and lots more. For more information and background on this year’s Zurich Film festival see here. Have fun and enjoy your films!